Somewhere in the hilly country of East Tennessee, you can meet Lester Ballard, the main character in Cormac McCarthy’s Child of God. And he is not a likeable type at all. He has been released from jail only to find that his place has been sold, and now he is homeless. This does not sit well with him, and frustration and hatred and rotten thoughts burn through him. Soon he finds a place in the woods, some abandoned shack where he holes up, lives his sorry and solitary life and falls more and more to pieces. Dirt, trash, violence, hatred, depravation flows through Lester’s life, and this is definitely not a comfortable read, although it is written in a poetic kind of prose, which I must say that I adored. The book is only 185 pages long, but it sat with me for a long time afterwards. Not as good as The Road, though, but definitely understandable that McCarthy is one of the most important American writers. 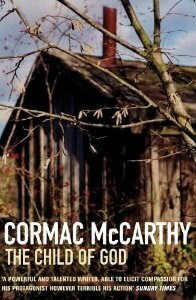 I love McCarthy but I haven't read this one yet. Sounds powerful. It sounds great. I do enjoy reading books that stay with me, but I have to be in the mood for them. Read this book earlier in the year, and absolutely loved it. It took me aaages to read though, despite its length.